For a trouble-free move to Fairfield, Meathead Movers is the company for you! Our professionally trained student-athlete movers are ready to get you into your new home. If you are moving to or from anywhere in Fairfield, we are the moving company for you! Our professionally trained student-athlete movers and our moving concierge service are here to help you with every stage of your move. In the heart of northern California, and located just 45 minutes in between San Francisco and Sacramento, Fairfield is a beautiful place to call home. The city is home to two award-winning golf courses: Paradise Valley and Rancho Solano where you can unwind with a round of golf and a drink at the club. You can also take a stroll or bike ride through any one of the city’s scenic bike trails. For those who want to make a splash, the city’s aquatic center has an indoor pool and an exciting outdoor play park! You can also get to know the culture of Fairfield by exploring its beautiful downtown. Not only does the downtown feature an array of great restaurants and shops, it also hosts a variety of parades and festivals, including a farmer’s market and yearly tomato festival. Both kids and adults will love touring the Jelly Belly Factory and learning how Jelly Beans are made as well as seeing the Jelly Belly art gallery. Adults can also enjoy a tour of the world-famous Anheuser-Busch Brewery and learn how Budweiser is created, all while enjoying a nice cold beer! 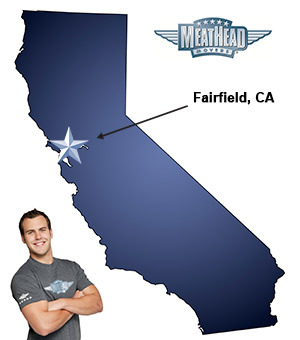 If you are considering a move to Fairfield, Meathead Movers is here to help! Our moving company specializes in local, long distance, and commercial moves. We also provide reliable packing, storage, on-site relocations, and our distinctive concierge service. All our student-athlete movers are thoroughly screened and trained before their first move. With branches all throughout California, we are your one-stop resource for all your needs, no matter where your California move takes you. In fact, you can read our reviews to see what your neighbors have to say about us! We are so confident in our services that we even offer a 100% satisfaction guarantee. So what do you have to lose? Contact Meathead Movers today for a free moving quote and learn how we can help you on your next move. Moving to Fairfield? Here are some helpful resources. The movers were fast and efficient in getting all my items loaded onto the truck, they were extra protective of the wood floors in my home which was greatly appreciated , and made a very stressful day a successful day. Ali was great, the phone help was easy, the moving crew are professional young men. Good guys - Kesean, John & Austin.